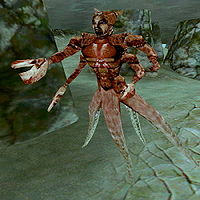 Alits are common tailless two-legged creatures found in the grasslands and ash wastes of Vvardenfell in Morrowind. They are similar to their more powerful cousin, the kagouti, and resemble a disproportionately large walking mouth. Diseased and Blighted Alit attacks are poisonous, and may also transmit their disease to the player. 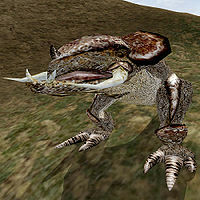 They are one of the two creatures in the game without unique sound effects—they share sounds with the hunger. The sounds are meant for the Alit however as their file name would indicate. It should also be noted that without Bloodmoon installed, creatures with unassigned sounds default to the Alit's. 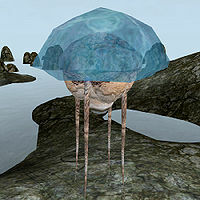 *Note: The regular Alit was given the Alit Bite ability in Morrowind Patch Project 1.6.6. 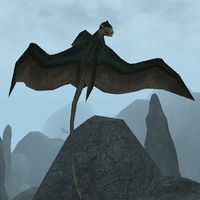 Cliff Racers are large flying creatures found throughout Vvardenfell. They are very aggressive and will attack anyone in sight. Cliff Racers have good vision range, and will often detect and follow the player without being noticed. This can result in swarms of them descending upon the unwary adventurer. Their AI can be rather flawed at times; for example they often go to you using non-linear routes, similar to "zig-zag" flying, and can get stuck for a while in trees. Dreugh are ancient part-human, part-octopus, and part-crustacean sea monsters commonly hunted for their skin (to make armor) and Dreugh Wax from their shells (for its magical properties). The wax found within their shells is highly valuable and useful if the player has a high alchemy skill. 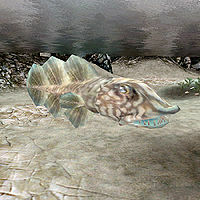 You will often encounter them in shallow water, in caves, and along the coastline. Dreugh can be found in high concentrations around Gnaar Mok, around Ebonheart in the waters below the bridge and the caves, in the deepest waters far off the coast of Seyda Neen, and in Koal Cave near Gnisis. Dreugh tend to swarm upon you while swimming or diving, so Water Walking is often a faster and safer alternative. When fighting them in melee, aim for where the tentacles connect to the torso. 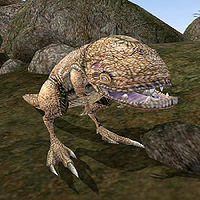 Guar are the primary domesticated herd animals of Vvardenfell and are not usually aggressive, with the exception of the somewhat rare Wild Guar. 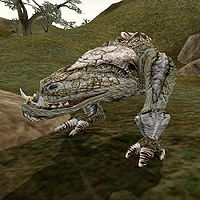 The more powerful relatives of the Alits, Kagoutis are large and aggressive two-legged animals with large tusks. 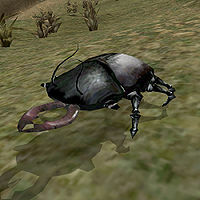 Mudcrabs are small, hard-shelled creatures found on the shores throughout Morrowind. They will only become aggressive when you come into close proximity of them. 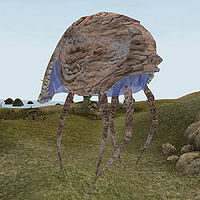 High concentrations of Mudcrabs can be found along the Bitter Coast near Seyda Neen, Gnaar Mok, Hla Oad and in Khuul. 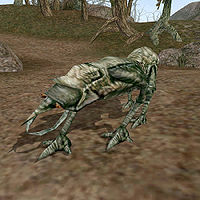 Be careful searching the Diseased Mudcrab bodies, as you may contract Swamp Fever. 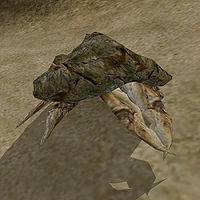 * This is the famous Mudcrab merchant. Netch are large, peaceful creatures resembling airborne jellyfish with the size and disposition of cattle. They are supported by internal sacs of magical vapors. Netch are herded by farmers in peaceful areas, as their hide makes a good quality leather. The female or "betty" Netch is smaller than the male or "bull", but is more easily provoked into aggression, especially in herds where the female-male ratio is kept higher than in the wild for faster breeding. Some bull Netch, however, have a poisonous attack. These creatures are non-aggressive, but can be defensive of their territory during their breeding season. Nix-Hounds are medium-sized predators that have been known to hunt in packs. They may be fast, but they are not very dangerous for medium-level players. They are easily defeated with Marksman weapons. 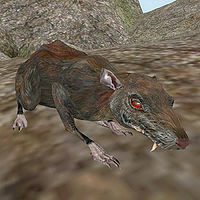 Rats are common rodents found throughout Morrowind. There are many variations of rats, though all are weak. Shalks are large and slightly aggressive beetles which use magical fire to attack. They can often be found in the Grazelands and in certain dungeons. 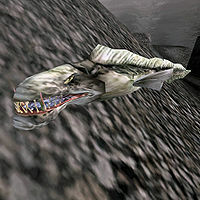 Slaughterfish are common and aggressive fish found in the waters surrounding Morrowind and in the flooded areas of shipwrecks. They are encountered often en masse and will form into large packs behind the player when swimming. This page was last modified on 27 October 2018, at 04:41.